Did not have an extra scope so I pulled my VX 3 8.5-25 off of my Rem 700 .223 and put it on my customized CZ 452. Went to the farm and sighted it in. Decided to give it a run on a score target at 50 yards today. This is the first and only target I shot with this particular brand of ammo. Winds were manageable from about 1-2:30. Not bad at all, Calvin! Will try a full 25bull target next time. Keep us posted about your CZ endeavours. No shots on the sighters, Cal you have big brass ones. Cal, that rifle needs to go. It plain missed the dot a bunch of times, I know someone who buys old beater .22's if you need to get rid of it quick! Hope you have a ton of fun with it. Am I allowed to contest bull 22? I have my fee ready. Dan, it's a long drive to Kenora, but it's worth it. Phil, I'll be driving east this fall to visit the family south of Barrie and will be passing by Kenora. If the timing is right I'd like to drop in to see your range. Dennis it is shooting well. I could not be happier for what a CZ 452 has to offer. Hey Calvin, That's a good shooting CZ but I just can't get over how big your 10 ring is. It looks about the size of our 9 ring. On our target if you just touch the dot the other side of your bullet is touching the 9 ring, we are using the WBSF rimfire target. Ian as you can see that is a IBS target. Yes it is larger when it comes to the bull. I believe it has the largest bull of all rimfire score targets. 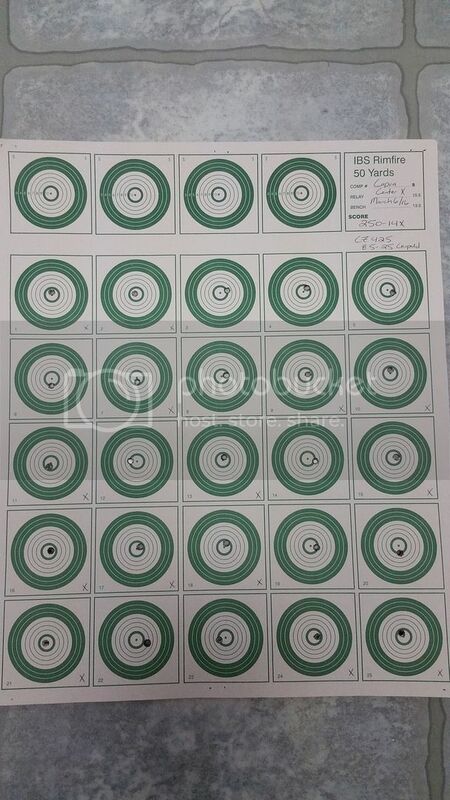 I along with one of my shooting buddies believe it is a great target to use for ease of scoring for new people to the sport. This is unlike using targets with smaller scoring areas. We want to entice people to the sport not chase them away is what we feel. If I have my way and rimfire BR becomes part of BRSC it would be utilizing the IBS target. It is like anything in BR....... a money game. Smaller targets are okay when the playing field is level in equipment but a lot of times it is not. So let's make it easy for the beginners. I've run a few rimfire matches with the WBSF target, small 10 ring. I ran two classes target rifle and factory rimfire class so not modifications to the rifle except tune the trigger, of course while I used a factory CZ452 I put myself in the target rifle class. The highlight for a lot of the factory shooters was a wipout and to recall everyone had some, they did see what experience and a good rifle can do as I managed a 670 12x with the CZ. The highest factory score was 551 4x and while not high all shooters came back for another go. I think a level playing field is the crucial thing to get people coming back and also to make it fun. Even using a factory rifle I put myself in target rifle class as I think experience counts for a lot. Years ago there was a team postal shoot going and I got a few NZ shooters to participate, this was in factory class. Well one shooter bailed at the last minute and didn't turn up so I used my BSA MK II and managed a better score at 100yds with the 22 than the others got with their centrefire rifles, needless to say I couldn't convince them to come and compete again...........all I had to do was drop a few more points and the fun may have continued. Rimfire shooting is fun, but I really enjoyed it when we shot 50yd and 100yd rimfire group competitions, there was nothing like watching that bullet curve through the air and watching it go through the target. Good luck in getting the rimfire shooting included.